The best track facility in Michigan is still being built. Today our fifty-part series goes north to the Great Lakes state. Eastern Michigan’s Rynearson Stadium holds 30,200, making it easily the largest track stadium in the state, now or ever. Ironically, in all likelihood the track has not been removed because it’s not cost-effective for EMU to put money into its football stadium; located just down the street from The Big House, Eastern Michigan’s football attendance is among the lowest in FBS. Michigan State lists a seating capacity of 1,500 for its Ralph Young Field. Grand Valley State’s track facility might seat more — it hosted the 2015 NCAA Division II championships — but I have not seen any specific numbers. 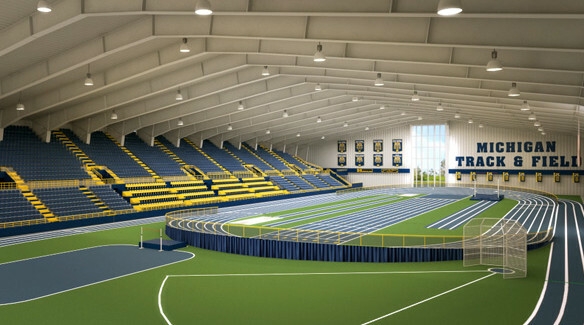 In any case, the University of Michigan will soon open an indoor track facility with seating for 2,000. The original plan for the facility called for a 300-meter flat track for training, overlaid with a 200 meter banked track for competition. The result gives a massive “D-zone” between the two tracks, where the high jump and throwing events would be contested. But as often happens, original plans may be scaled back due to funding limitations. The locals say that the most beautiful stadium in Michigan’s Upper Peninsula is at Norway High School. I cannot find any photo that appears to do it justice — but it’s the UP, OK? It’s gotta be pretty. UM athletic director Don Canham – a former Wolverine high jumper who went on to be the head track coach before assuming AD duties – was the man who made the NCAA Indoor Championships possible. He more or less created the meet in 1965 and made it profitable after just one year. 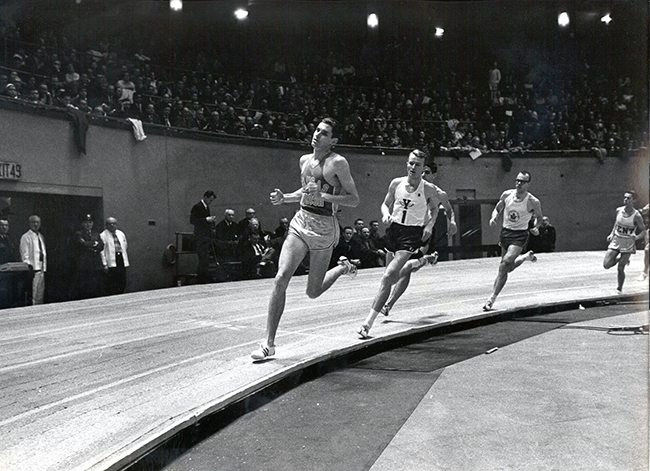 The first fifteen editions of the meet were held at Detroit’s Cobo Arena, attracting sellout crowds of more than 10,000. The record attendance for a track meet in Michigan is 15,060 for the 1983 NCAAs at the Pontiac Silverdome, but doubtlessly many meets at Cobo would have drawn more if the seating had been available. Michigan’s new facilities plan will pave over Ferry Field, the home of the Wolverine track teams since 1906 and best known as the site where Jesse Owens set four world records in a single afternoon. Unless I’m mistaken, though, the actual site of Owen’s feat is now underneath the adjacent Intramural Building, and the modern Ferry Field track is not up to the standards of a Power Five conference program. If you are including indoor tracks, I’m thinking you have not yet been to Saginaw Valley State University. It is worth checking out.